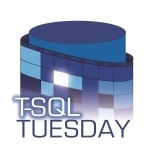 This entry was posted in Tsql2sday, Uncategorized and tagged tsql2sday, TsqlTuesday. Bookmark the permalink. Thanks again for hosting, Pat! I’m looking forward to my turn come April. Nancy my apologies I either missed it or it didn’t show up in the list somewhere. 🙂 Really sorry about that! Pingback: Does Automation Kill the DBA "Store"